It is a beautiful weekend here in Portland, Oregon. The sky is a bright, cloudless blue and the weather has cooled to a perfect 70 degrees. It's the first days of autumn and I can't help but feel excited. Maybe it's a residual from all those years of school, but I feel like it's this time of year -- fall, not winter -- that brings changes, signifying new things and new beginnings. And I'm excited for it. 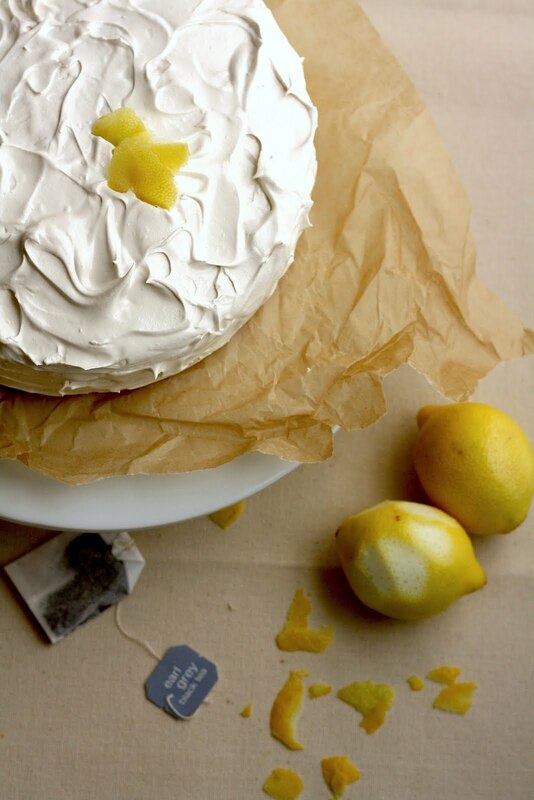 This folks, is a lemon cake covered with an Earl Grey meringue frosting. Now I normally don't do meringue frostings. They are too hit or miss -- I find them to be too sticky and too sweet. And that's why I stick to buttercreams and cream cheese frostings. But honestly, this frosting was one of the best I've ever made. Not too sweet, with a strong Earl Grey flavor with every bite. The texture was light and fluffy, perfect for frosting a beautiful cake. The cake base was also nothing to forget about. It's got two layers, and the recipe instructs you to pour a lemon glaze over both layers of the cake while it's still warm. 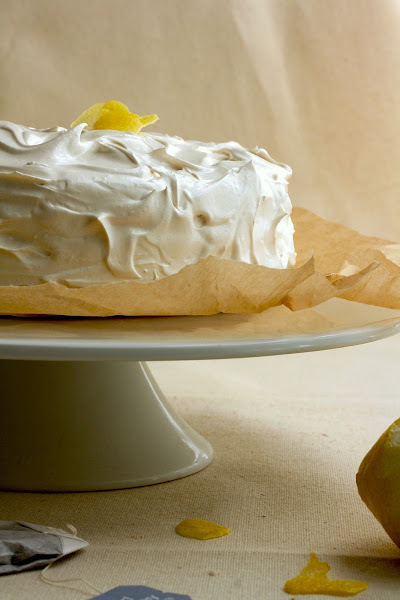 The glaze adds a wonderful sweetness and strengthens the cake's lemon flavor, ensuring that the lemon flavor doesn't get drowned out by the Earl Grey frosting. The perfect cake to celebrate the changing of seasons, new beginnings, and just life in general. Center a rack in the oven and preheat to 350 (F). Butter two 9 x 2 inch round cake pans and line the bottom of each pan with a round of buttered parchment or wax paper. Put the pans on a baking sheet. In a medium bowl, whisk together 2 1/4 cups cake flour, 1 tablespoon baking powder, and 1/2 teaspoon salt. Set aside. In another medium bowl, whisk together 1 1/4 cups milk and 4 egg whites. Set aside. In the bowl of a stand mixer fitted with a paddle attachment, beat together 1 1/2 cups sugar and 2 teaspoons lemon zest on low speed, until the sugar is moist and fragrant. Add 1 stick of butter to the lemon and sugar mixture and beat at medium speed until the butter and sugar are very light and fluffy. Beat in 1/2 teaspoon of lemon extract, then add one third of the flour mixture, still beating on medium speed. Beat in half of the milk and egg mixture (from the third step), then beat in half of the remaining ingredients until incorporated. Add the rest of the milk and egg mixture, beating until the batter is homogenous, then add the last of the dry ingredients and continue beating until just incorporated. Divide the batter between the two pans and smooth the tops with a rubber spatula. 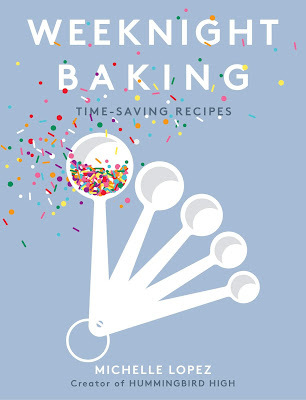 Bake 30 to 35 minutes, or until the cakes are well risen and springy to the touch. A toothpick inserted in the center of each cake round should come out clean. Transfer the cakes to a cooling rack and cool for about 5 minutes, then run a knife around the sides of the cakes, unmold them, and peel off the paper liners. Invert and cool to room temperature right side up. While the cakes are still warm, poke both rounds all over with a fork. 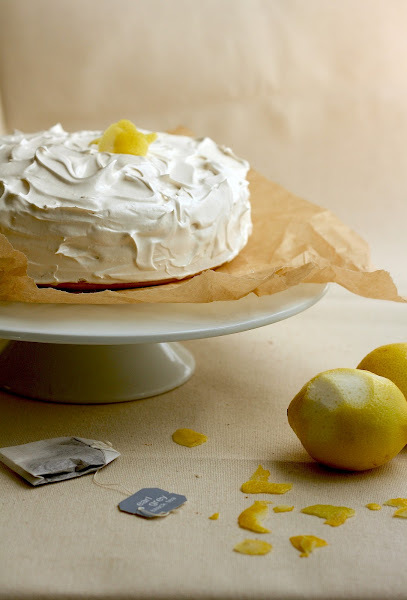 Make the lemon glaze by stirring together 1/4 cup sugar and 3 tablespoons lemon juice in a small bowl. 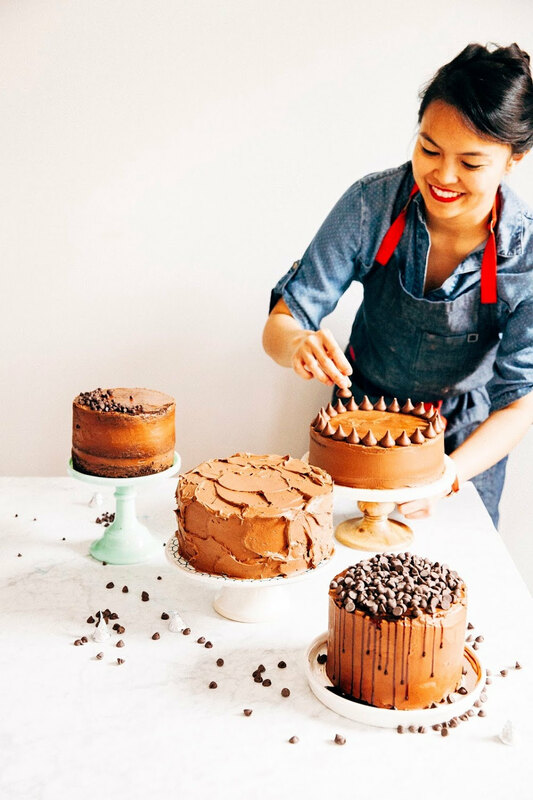 Use a rubber spatula to divide glaze evenly and spread all over the tops of each cake round. When the cakes have cooled, frost each cake with Earl Grey tea frosting (recipe follows). Beat 2 egg whites in the bowl of a stand mixer fitted with a whisk attachment until the egg whites are foamy and thick. They should have the ability to mound, but not peak -- if they've started to peak, you've overbeaten the egg whites. In a saucepan, combine 1 cup sugar, 1/4 teaspoon cream of tartar, 1/3 cup strongly brewed Earl Grey tea, and 1/8 teaspoon salt. Boil for 3 - 4 minutes, or until all the sugar is dissolved. Begin beating egg whites (from the first step) again and slowly pour in the boiling sugar syrup (from the second step) in a slow stream. Continue to beat on high for 4 minutes or until stiff peaks form. Add 1/4 black tea by the tablespoon, beating after each addition. Continue to beat until frosting reaches desired consistency -- it took me about another 3 minutes or so. The whole process should take around 7 minutes. Use frosting immediately. Oh yeah, I'm going to have to try this!! I looove Earl Grey. I've always wanted to bake something with tea in it. As much as I drink tea (usually twice a day), you'd think everything I bake would have tea in it! This was a pretty involved recipe, but WOW was it ever worth it. We also used a blowtorch to set the meringue on the outside at the end a little bit, and also because, you know, fire is exciting. I have just finished making this cake and I am so excited to taste it in a little while! Everything seems to have turned out beautifully, and my frosting looks just like your picture, but I am unsure about the texture. I've never made a meringue frosting before, so I am wondering if it is supposed to be so light and airy. 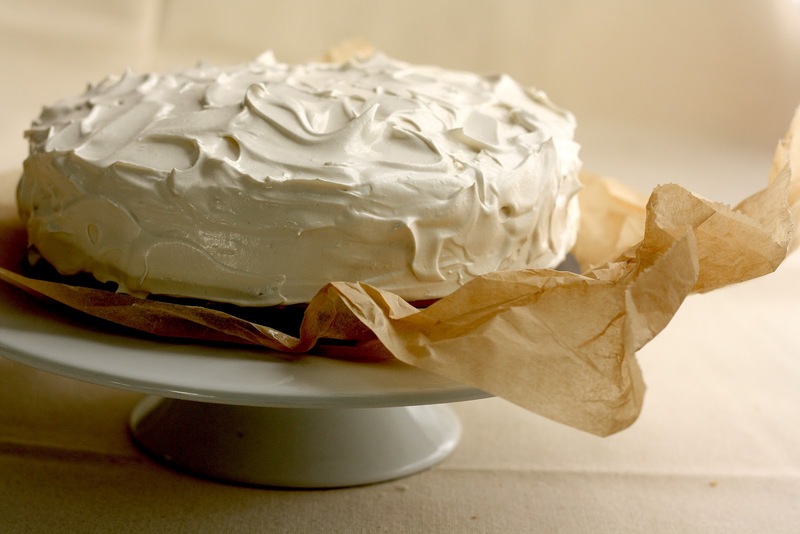 The frosting is based on a 7-minute frosting, so it is indeed super light and airy. It sets as time goes on. Sounds like you did it right! I also just made it with blood oranges instead of lemons. The cake was wonderful. The earl grey was too subtle for me. I wonder if I could sprinkle a little tea leaves on the cake, if that would help? Should this cake be served as soon as it's done? Or shall I wait? For how long?